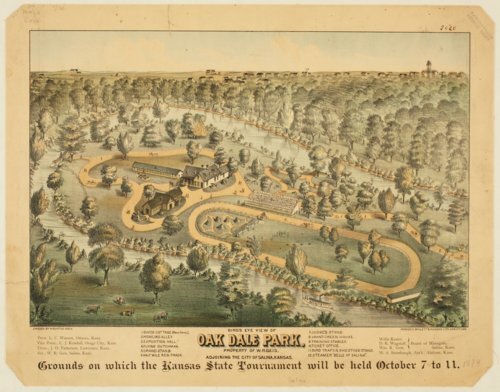 Artist Augustus Koch drew this bird's eye view of Oak Dale Park in Salina, Kansas, in the 1870s and Ramsey, Millett & Hudsen, lithographers of Kansas City, Missouri, created this print in 1879. The print shows the park confined within a bow of the Smoky Hill River outside of Salina. W. R. Geis owned the property and was secretary and manager of the Kansas State Tournament which was held at the park from October 7 - 11, 1879. Besides Geis, tournament organizers included L. C. Wasson, Ottawa; C. J. Kendall, Osage City; J. D. Patterson, Lawrence; Willis Kesler, Salina; D. R. Wagstaff, Salina; W. S. Stambaugh, Abilene. The park included a Swiss cottage (park hotel), a bowling alley, an exposition hall, a flying dutchman merry-go-round, a grand stand and half-mile track, a judge's stand, Vahn's greenhouse, training stables, a ticket office, bird traps and shooting stand, and a river boat steamer called the "Belle of Salina." Since 1977 the park has been home to the annual Smoky Hill River Festival arts fair. Creator: Ramsey, Millett & Hudson Lith., Kansas City, MO.